Paul Dawson being presented with Matthew Kemmy’s Intermediate Hurler of the year award tonight at the Kildare GAA Awards tonight. Congratulations Matthew! We are delighted to be nominated for club of the year and well done to Matthew Kemmy who has been nominated for Intermediate Hurler of the year. 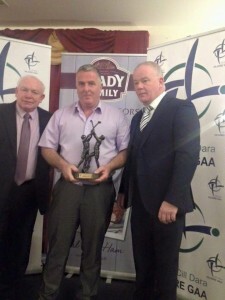 The Kildare GAA Awards take place on Saturday 21st November in Celbridge Manor Hotel!